This yard was transformed from a bland bilder basic to a fun and lush xeriscaped entry way. 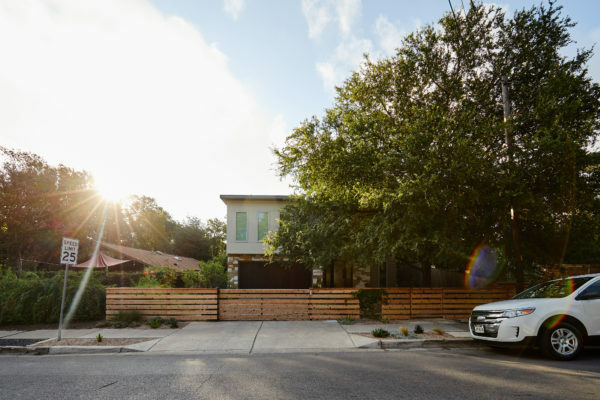 To make the yard feel bigger, we removed the driveway and used gravel from end to end, creating an open, borderless planting and patio space across the entire front yard. For extra security and privacy, a fence was added along the front, which features an automatic gate for easy use as they come and go. With the limestone facade being one of the customers least favorite features of the house, we planted fig ivy vines to grow and cover it. These customers thought their space was too small to utilize in the way they wanted. We introduced the idea of small spaces needing to be simple, yet impactful in every material and placement chosen. To make the space feel larger, we emphasized the visual height of the space with tall pottery, trellis work, and an herb planter wall, while taking advantage of unused space under the stairs to create storage. 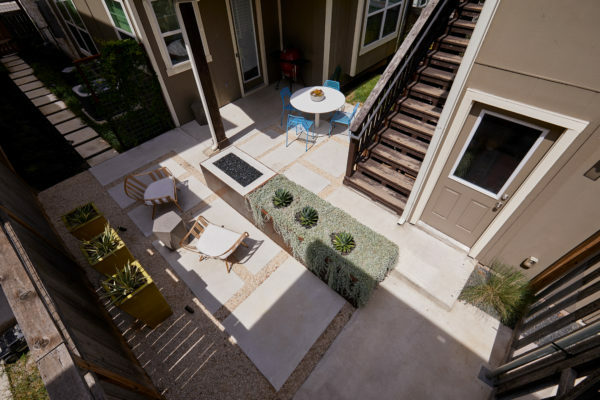 The large concrete patio pavers also assist with the illusion of a larger space. The entire space centers around a custom designed iron planter and fire pit combo for night time lounge entertaining. This became more than another landscape installation, this became about family! We were first contacted by this amazing husband and wife team back when the in-laws were first invited into their home! The homeowners being custom home builders made this project a fun and personable collaboration! 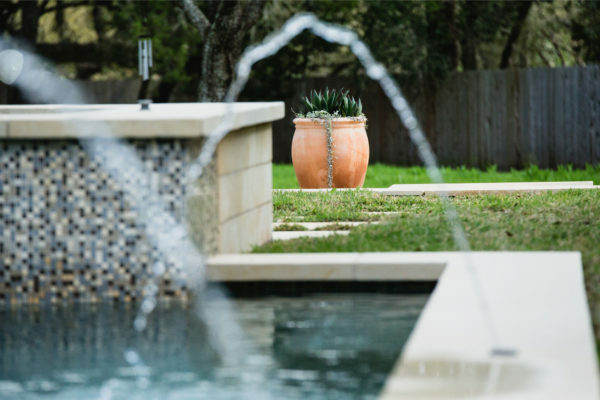 We designed this landscape with the same core principals they built their home with; sustainability – but more importantly, love and family. 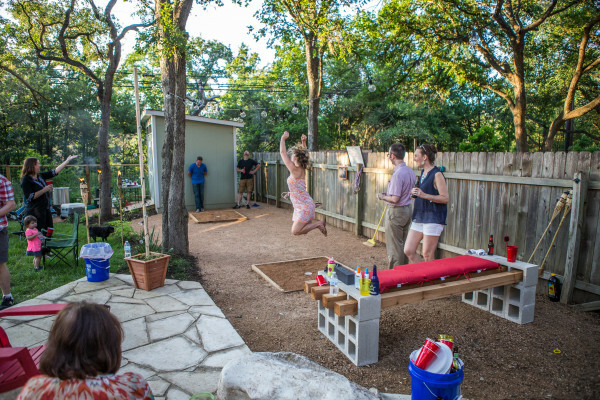 With a passion for entertaining both children and adults, this family needed a flexible and usable space. Additionally, recent construction had changed the family’s greenbelt view, into an industrial eye sore. 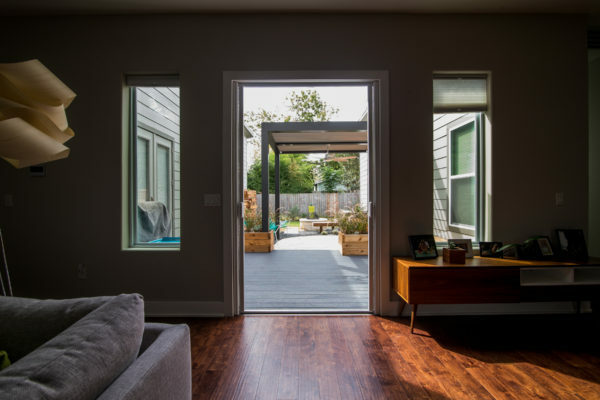 Taking cues from the modern interior decorating of the house, we revitalized this tired and tiny back yard into an open and flowing oasis of fun and functionality. 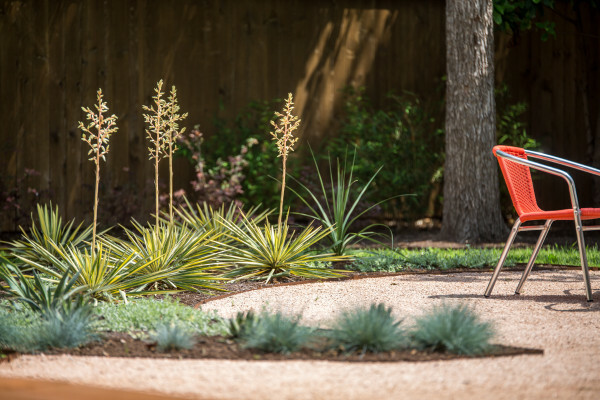 A low maintenance, drought tolerant plant palette was a must for this busy family, and is reflected in our plant choices of ornamental grasses and agaves. A custom constructed swing complements and anchors the play area, without visually invading the overall esthetic of the yard. The swings construction will easily accommodate a hammock as the children get older. The implantation of bamboo screening hides the new industrial area by blending the space into the surrounding greenbelt. 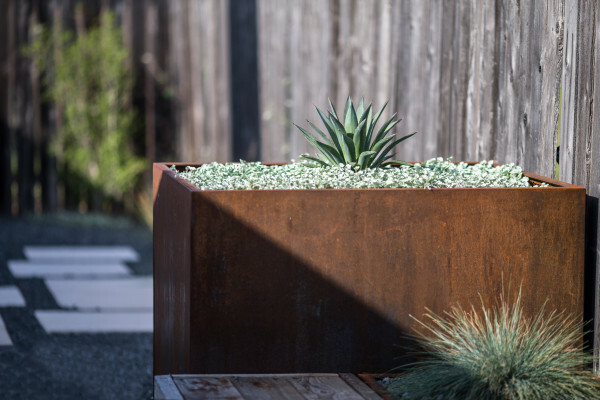 Custom cedar benches provide additional seating and are complimented by large custom metal planters to anchor the space. Removing large areas of struggling grass and replacing it with limestone and black gravel, creates a perfect area for larger groups to mingle. With distinct areas for children play, adult seating and “free range socializing” this small space is ready for big parties.